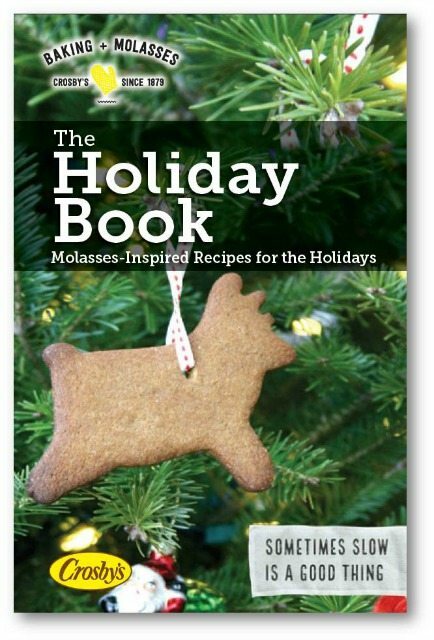 From cookies to candied nuts, this free Holiday eBook has everything you need for a homemade Christmas. Gluten-free options too. 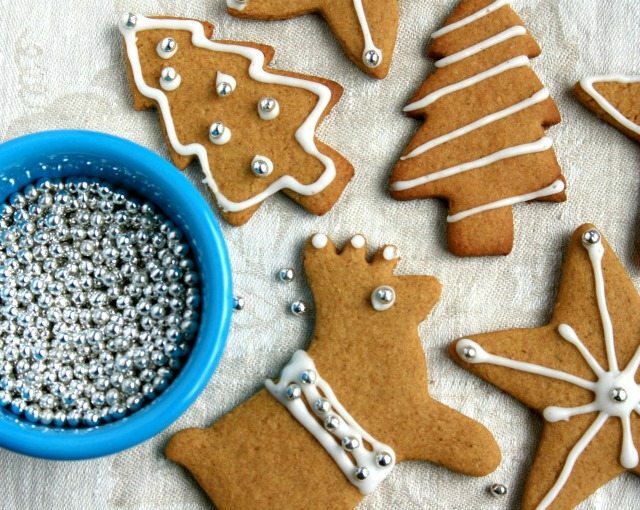 Do your favourite Holiday traditions involve food? So much of what is special about the season is tied to the taste, smell and sharing of food that is only prepared this time of year.  Food is part of what brings us together, and it’s at the root of our most meaningful generosity. From food bank donations to gathering around the table with friends and family, the act of sharing food does more than fill the belly. It connects us with others and feeds the soul. If gathering around the table with family and friends makes your December sparkle I think you’ll enjoy our updated free Holiday eBook. 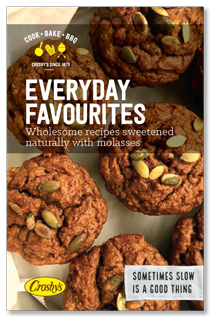 It includes some of my favourite molasses cookie recipes and a selection of other homemade treats that are perfect for sharing. This updated book also includes warming drinks and some new gluten-free Holiday treats (coconut macaroons and almond tuiles). 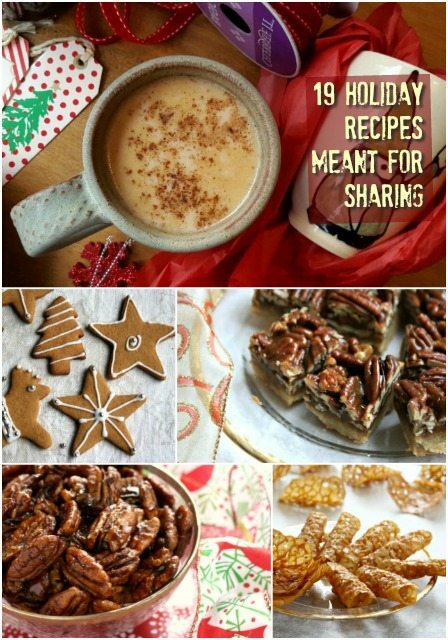 I hope that these recipes give you more ways to share during this season of giving and gathering. 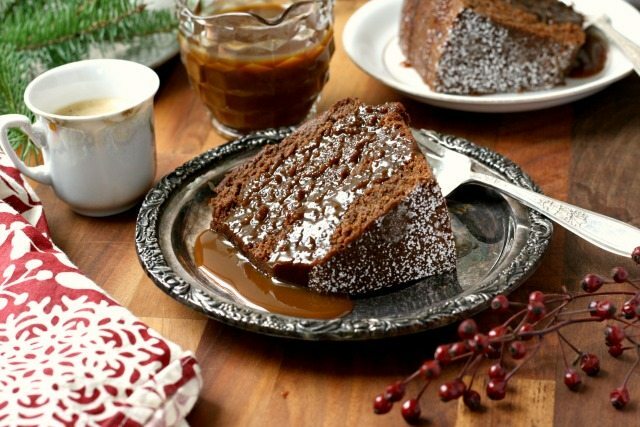 Chocolate gingerbread bundt cake is a beautifully spiced Holiday cake meant for sharing. 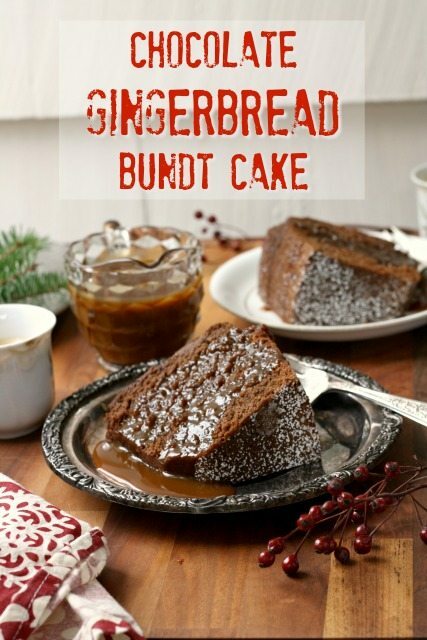 If you’re in need of a dessert idea for a Holiday gathering chocolate gingerbread bundt cake is your answer. 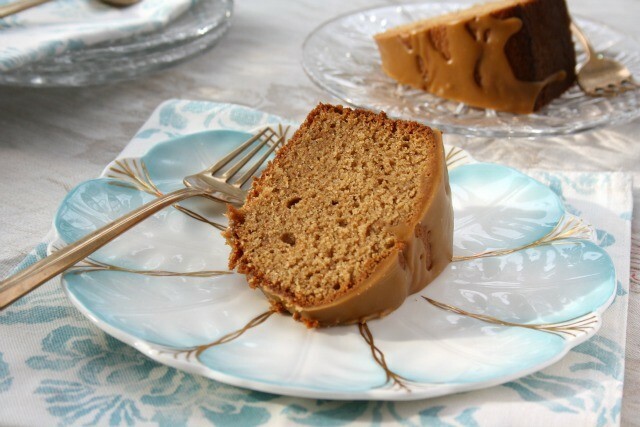 Beautifully spiced and with a firm crumb it’s the kind of cake that is easy to slice and travels well. Even better, it doesn’t need frosting. 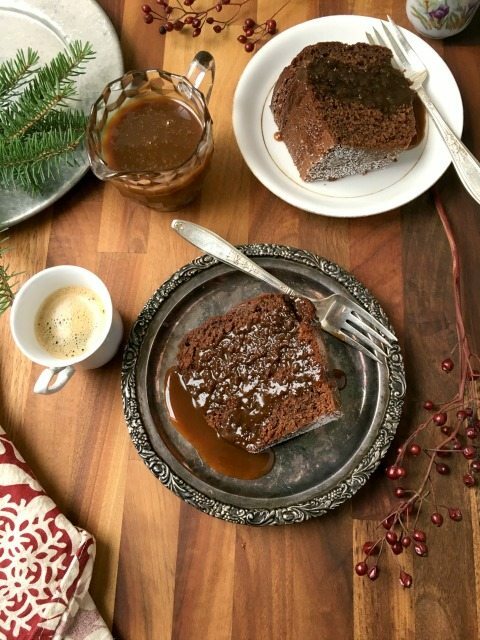 Just a sprinkling of icing sugar will dress it up enough and a generous drizzle of molasses toffee sauce will make it extra special. 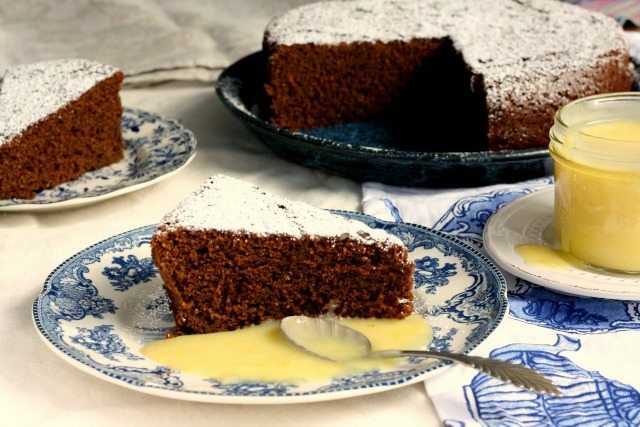 If you didn’t already know, chocolate, spice and molasses are a lovely combination. This isn’t a chocolate cake, per se, but you can catch a hint of chocolate flavour in each bite. 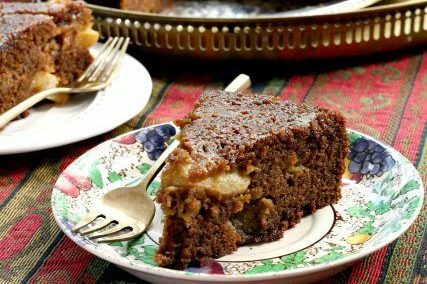 The full tablespoon of ginger in this recipe is no typo and even with all of the spice this cake has a mild flavour. 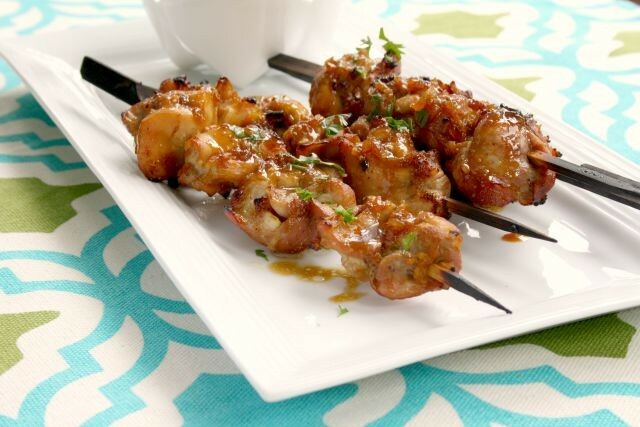 This recipe is from a Sobeys recipe magazine (link at bottom of post). Preheat oven to 350°F. Grease a 9 or 10-in. bundt or tube pan and dust with flour. In a medium bowl, whisk together the flour, cocoa, baking powder, baking soda, ginger, cinnamon, salt, nutmeg and cloves. In another bowl, beat butter and sugar until light and fluffy. Beat in eggs one at a time. Beat in molasses and vanilla. Add the dry mixture to the creamed mixture in three additions, alternating with the sour cream (beginning and ending with the dry mixture). Scrape batter into prepared pan and smooth the top. Bake 50 minutes to an hour, until a tester comes out clean when inserted into centre of cake and when the cake starts to pull away from the sides of the pan. 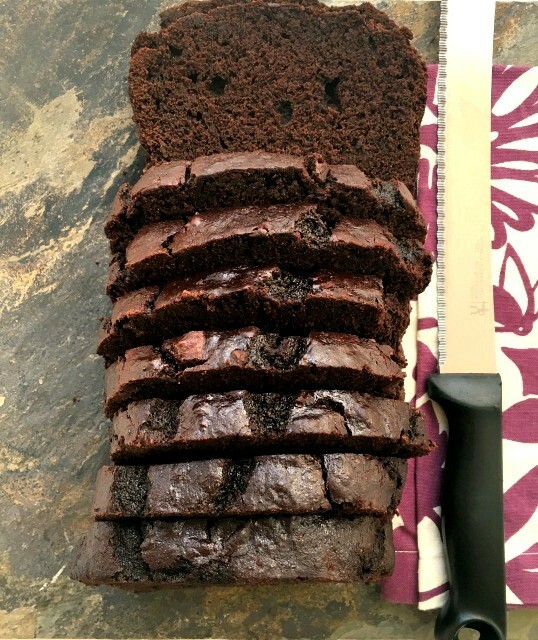 Cool cake in pan for 10-20 minutes, then invert onto a cooling rack. When ready to serve, sprinkle over icing sugar. 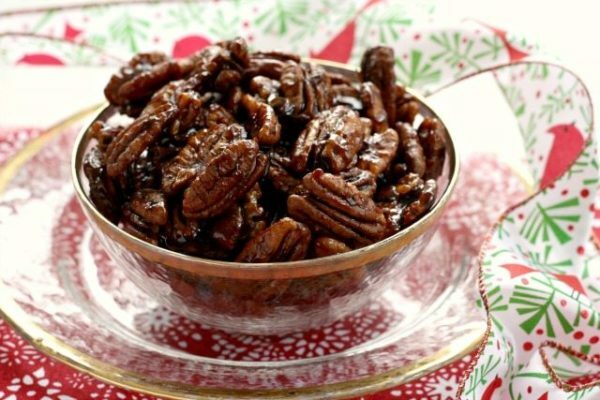 Maple Molasses Candied Pecans are the perfect hostess gift or an easy snack for guests. When you want a good nibble in a hurry, candied nuts are always a great option. They’re quick to mix up, don’t take long to bake and are so yummy. When I was growing up we’d have a big bowl of whole nuts in the living room. It was an old fashioned sort of holiday treat that you could leave out all through December. 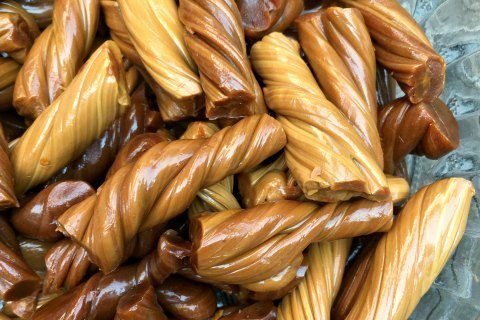 As kids we preferred bowls of ribbon candy or barley toys but once in a while we’d sit down beside the bowl and start the slow process of snacking. You have likely noticed that the tradition continues and you can still find mesh bags of mixed nuts in the produce section of the grocery store. In this world where so much is processed and prepackaged it’s comforting to see something as simple as whole nuts are still available. 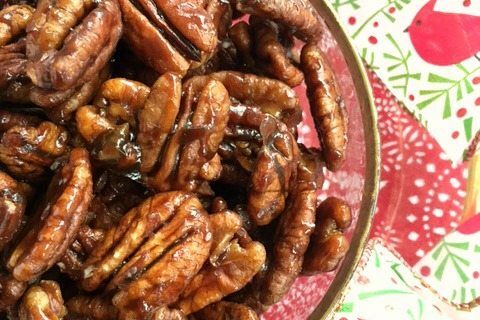 We have other recipes for candied nuts on this website but I have to say Maple Molasses Candied Pecans are the easiest. 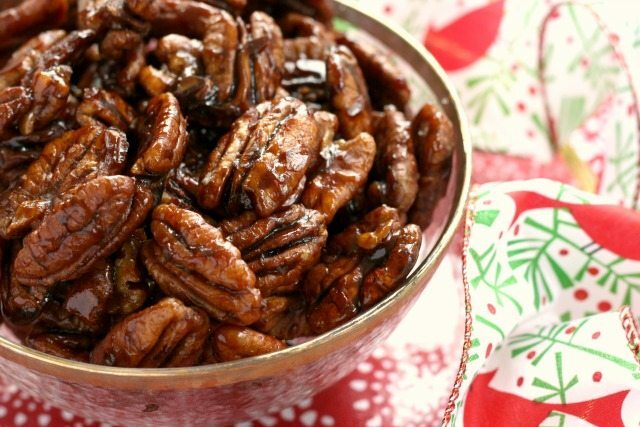 Pecans toast up quickly and evenly, and the whole batch is ready in under 30 minutes. Feel free to change up the spices. The recipe is adapted ever so slightly from the lovely blog The Cafe Sucre Farine. You might also like our Gingerbread Spiced Almonds and Five-Spice Candied Nuts. Preheat oven to 325˚F. Line a cookie sheet with parchment paper. Have a second sheet of parchment nearby. Combine all ingredients except pecans in a medium pot. Stir to combine then stir in pecans. Warm over medium heat until mixture is very runny (don’t boil) for about two minutes, stirring constantly. Pour mixture onto prepared pan and spread into a single layer. Bake for 10 minutes. 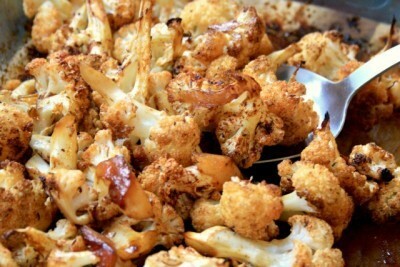 Remove from oven and stir well then spread out again to a single layer. Bake until deep golden brown, about 8-12 minutes more. Watch carefully so they don’t overcook. Gingerbread is best shared with friends. 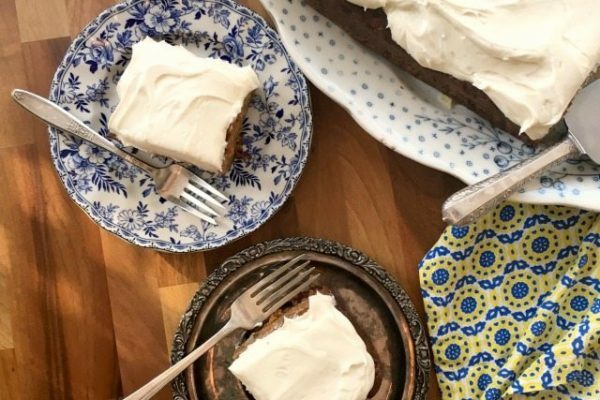 A one-bowl gingerbread recipe that makes a good sized cake is the easiest way to have more to go around. 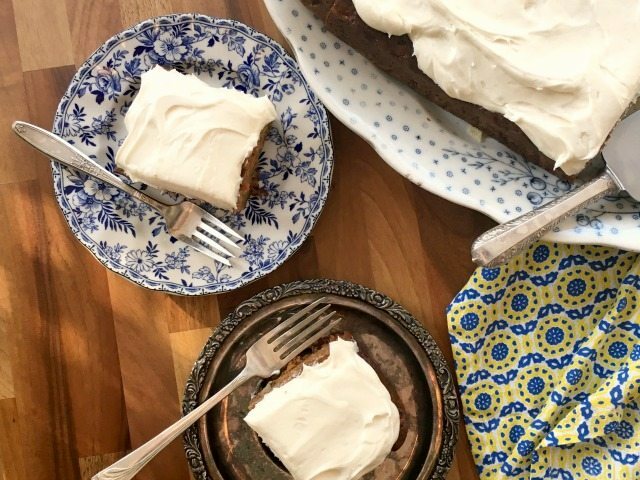 There’s nothing better than a dessert recipe that can feed a crowd. Not every recipe doubles well and sometimes making two of something is more effort than you have time for. That’s where a big-batch cake comes in handy. One bowl. On pan. One less thing to prep for a gathering. I was given this recipe last month for a fundraiser that I was helping out with. It’s a family favourite of a woman I volunteer with, and she passed it out to 10 of us to bake for dessert for the fundraiser. We had to deliver it sliced which meant I was able to taste a little sliver. 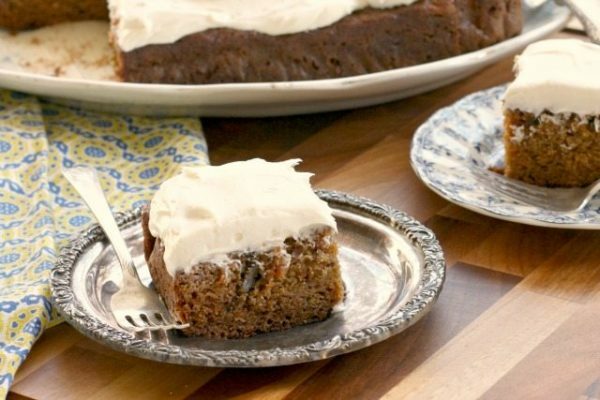 One-Bowl Gingerbread Cake for a Crowd has everything you love about a classic gingerbread. 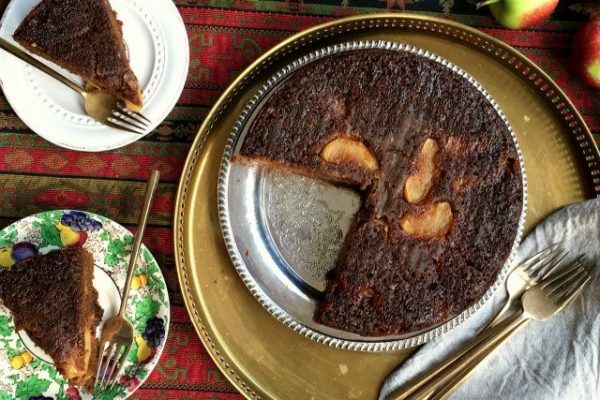 Beautifully spiced and with a texture that is just dense enough, this is the cake you want to make for your Christmas (or any other festive) gathering. Make it ahead if you have time since it only gets better with age. 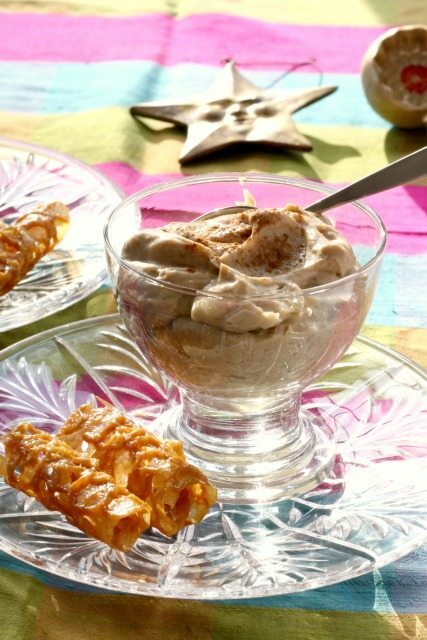 Serve it warm with cinnamon whipped cream or our Quick Coffee Toffee Sauce or Toasted Pecan Caramel Sauce. Hard to believe, but in all my years of making gingerbread this is the first classic GB recipe I have ever made that calls for a 9”x 13” pan. 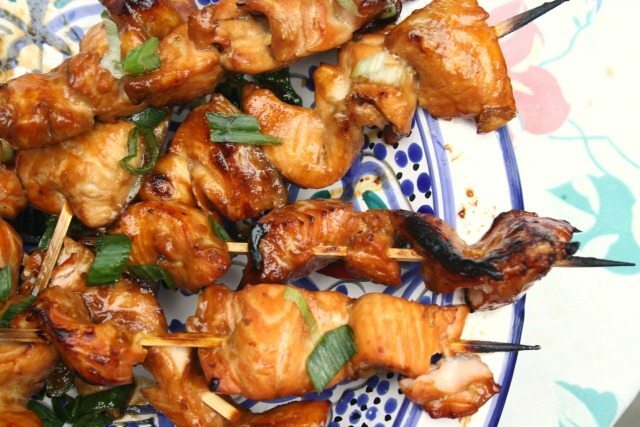 This recipe can serve up to 20. In a large bowl beat butter with sugar. Beat in eggs then molasses. Beat in water. 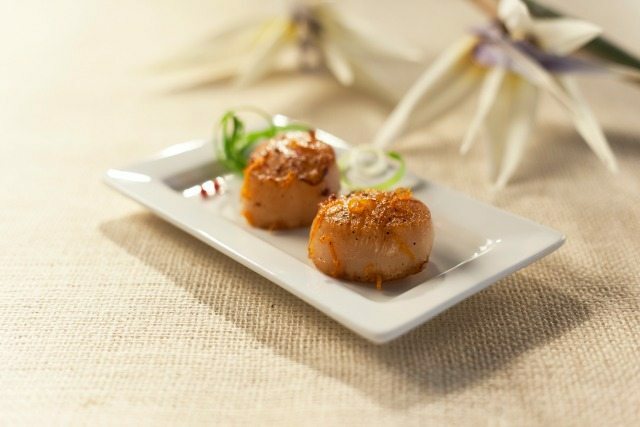 Serve with cinnamon whipped cream. 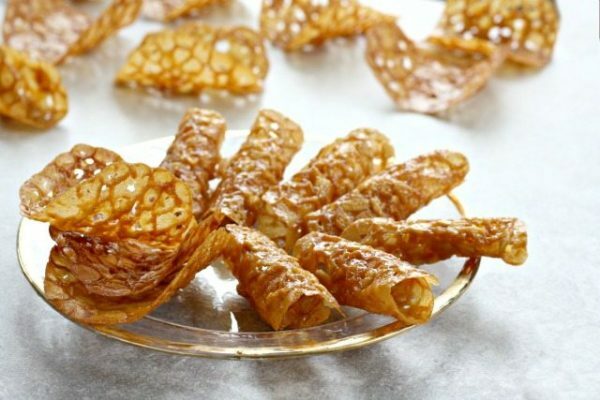 Easy Molasses Almond Tuiles – A festive golden cookie that’s lacy and crisp. 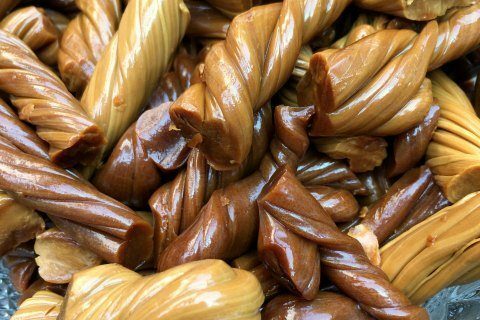 Molasses almond tuiles is one of those Holiday cookie recipes that looks fiddly and impressive but really takes little effort. 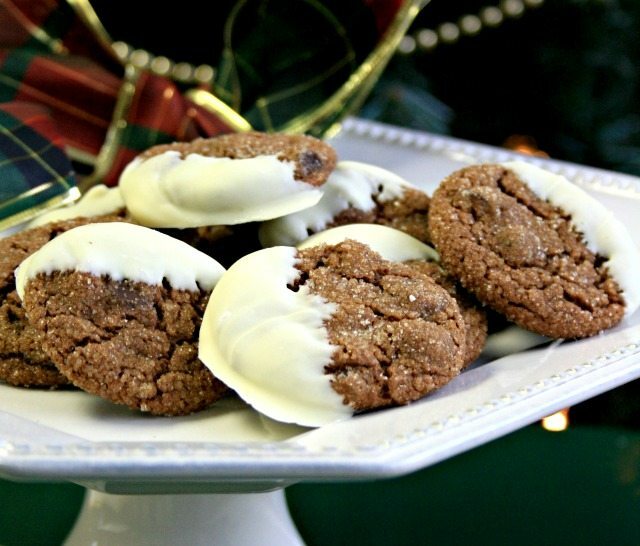 The batter mixes up quickly and goes a long way (this recipe makes about 50 cookies). When I was in high school and university my mom used to head off to New York City in early December with a group of friends. From the stories mom would tell about the decorations, it seemed like the most festive city in the world. Mom loved to visit the specialty food shops and would come home with imported cookies that we couldn’t get at home. One of the treats she would bring us were cigar shaped cookies that were crisp and filled with chocolate. I loved the look of them on a plate and the crispy texture was outstanding. The crispy texture of these cookies reminds me a bit of those special New York treats. It makes them irresistible, like potato chips. My greatest challenge with this recipe was gathering enough suitable things to drape the warm cookies over until they had set. (I used my rolling pin and a bunch of slender vinegar bottles.) 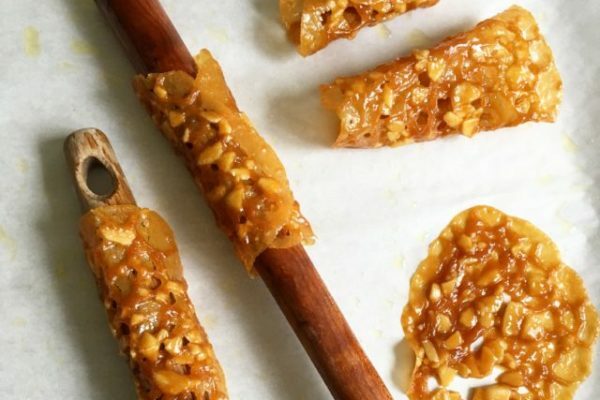 You can also create cigar-shaped cookies by rolling the just-baked tuiles around the handle of a wooden spoon. 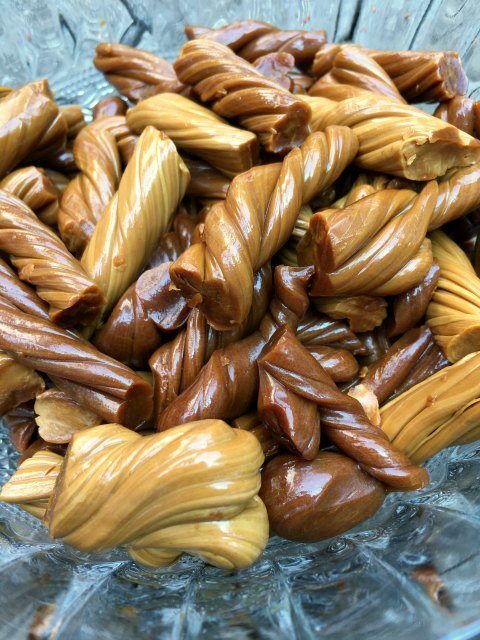 Add molasses almond tuiles to your cookie tray or use them to decorate holiday cakes. 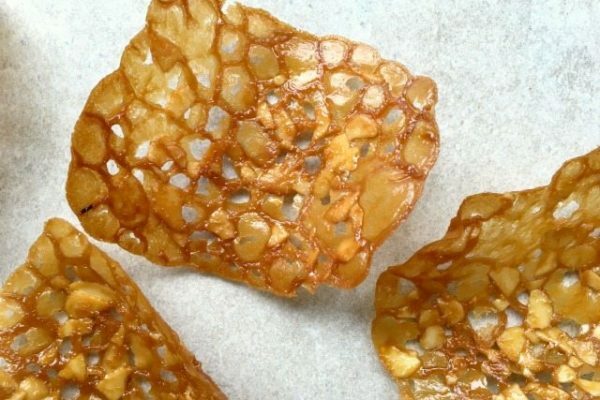 The recipe is adapted from a tuile recipe in the December 2016 issue of Canadian Living magazine. In a medium saucepan melt butter over medium heat. Stir in brown sugar, molasses, honey, lemon juice and salt. Cook, stirring constantly, until sugar is dissolved (2 min.). 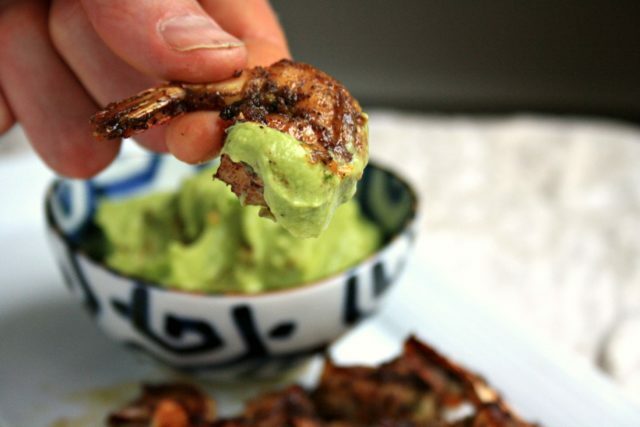 Remove from heat and stir in flour and almonds. Chill until firm (about an hour). Preheat oven to 350 F and line large baking sheets with parchment paper. Using a teaspoon measuring spoon, scoop batter and roll into balls. Arrange on baking sheet about 3” apart. Bake until golden and bubbly, about 8 minutes. Let cool until starting to firm up (about 90 seconds). Transfer directly to rack to cool completely. Refrigerate dough between batches to firm up. If you’re squeezed for time leading up to the Holidays (and who isn’t? 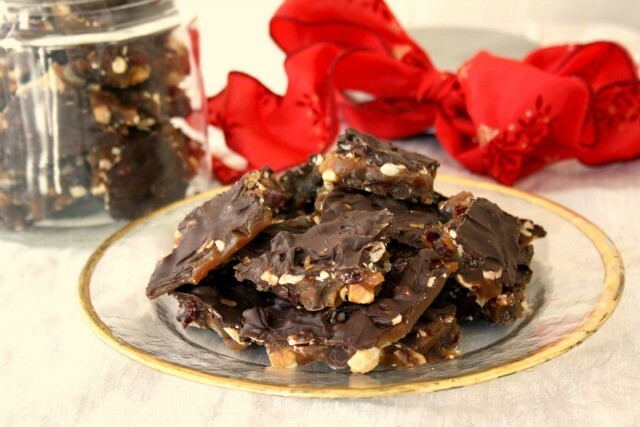 ), but still want to have a few festive sweets on hand, here are my top six suggestions for cookies and bars that are festive and easy. 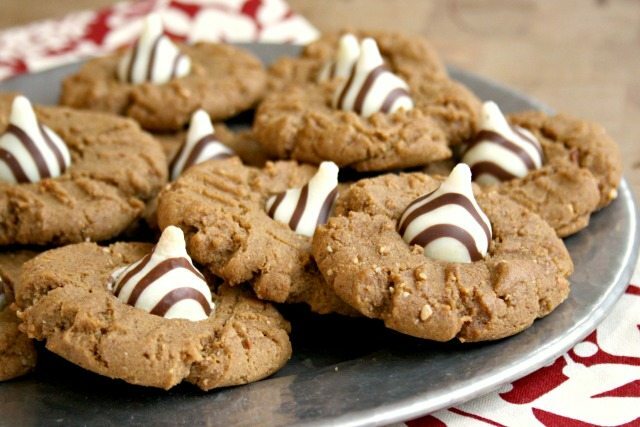 These are the fail proof Holiday cookie recipes that everyone needs in their recipe box. 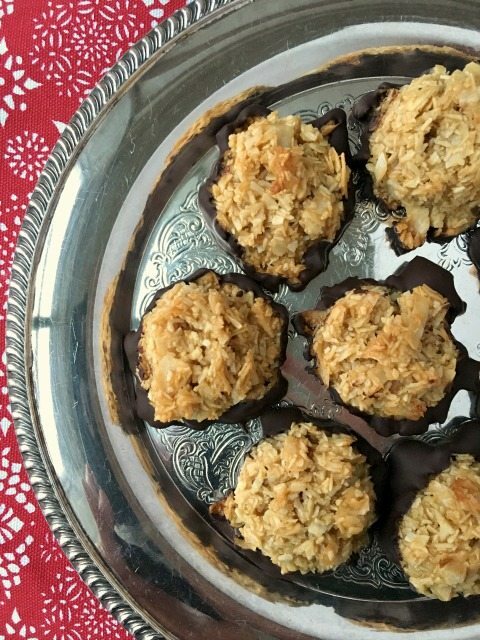 These are festive and delicious cookies that suit Holiday parties. They’re pretty enough to give as hostess gifts too, packaged with a bow (and the recipe tucked alongside). 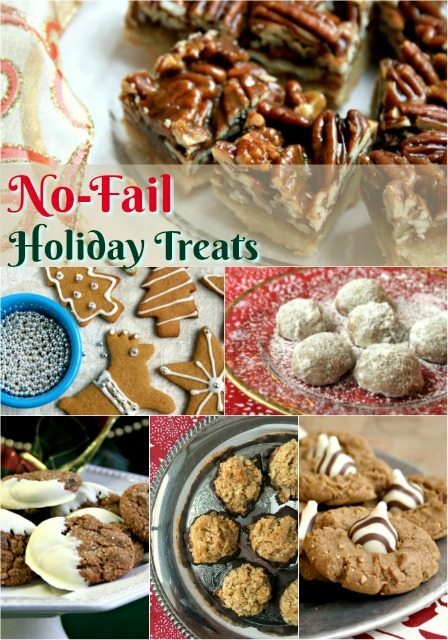 Most of these recipes are fun to bake with children too and decorating Holiday cookies makes a wonderful family tradition. The helpful thing about most cookie recipes is that the dough can be refrigerated. Mix it up in the evening when you have a few minutes to spare and then bake the cookies another day when you have more time to spend in the kitchen. Cookie dough gets better with age since refrigerating your cookie dough actually improves the texture and flavour of the finished cookie. Chilled cookies will taste a little sweeter and the sugars will caramelize more quickly when baked. Chilling dough also helps with the texture of your finished cookies since it allows the gluten in the flour to relax. Flavours, like spices, have more time to develop when the dough is chilled. If you have time, chilling your dough overnight, and up to 36 hours, can make a tasty difference. 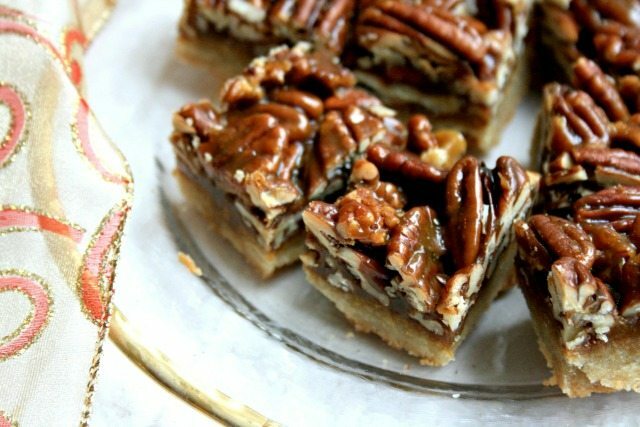 A buttery toffee thick with pecans layered on a barely-sweet shortbread base. They’re gorgeous but not over the top. They’re festive and beyond delicious. These cookies go by all sorts of names but they’re all the same buttery shortbread-style cookie loaded with ground nuts and coated in powdery white icing sugar. 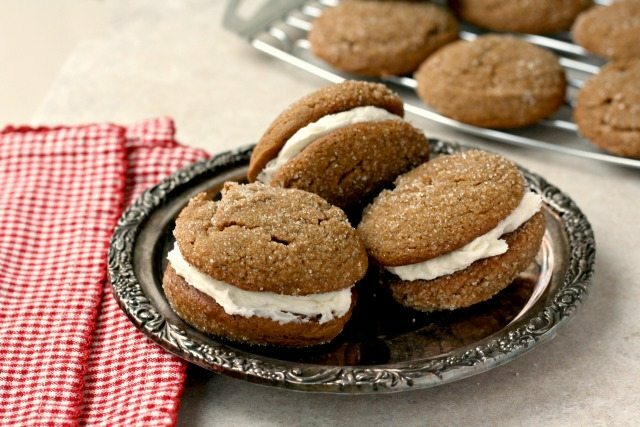 Mmm, Gingerbread Whoopie Pies. Soft, cake-like cookies sandwiched with fluffy frosting turns a simple cookie into a true treat. For many years my brother and his wife lived just around the corner from a bakery devoted entirely to whoopie pies. There were classic chocolate whoopie pies, peanut butter whoopie pies, vanilla whoopie pies and mini chocolate-dipped whoopie pies called whoop-de-dos’s. You could even special order a giant whoopie pie to serve as a birthday cake. 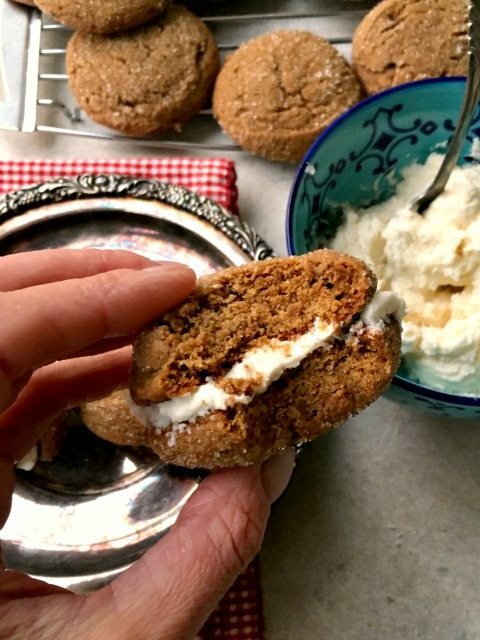 I don’t recall of they served gingerbread whoopie pies but suffice to say we enjoyed our fair share of the other varieties of whoopie pies on visits to their place. Whoopie pies will always delight! There is something extra special about soft, cake-like cookies sandwiched with fluffy frosting. It turns a simple cookie into a true treat. This recipe is from Bite Me Bakery in Toronto. 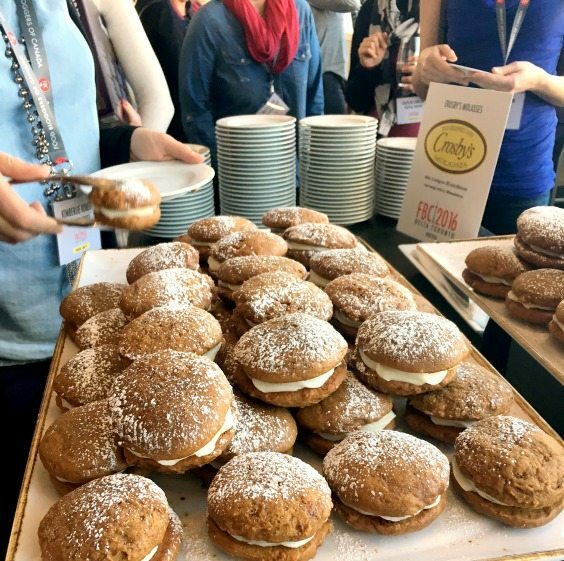 Dayna, the “sweet entrepreneur” at the Bakery, baked these whoopie pies for a coffee break treat at a recent conference I attended. Dayna sandwiched them with cream cheese frosting but since I don’t often have cream cheese on hand I use a simple icing for my version. In a large bowl beat butter and brown sugar until light and fluffy. Add molasses, egg, and vanilla – beat until well combined. Gradually add the flour mixture until well combined. Cover in plastic wrap and refrigerate for 4 hours – or ideally, overnight. Preheat oven to 350 F. Scoop the dough into 1 1/2-inch balls and roll in granulated sugar. Place 2 inches apart on parchment baking sheets. Bake 12-14 minutes or until set. Cool before sandwiching with frosting. Beat the butter with half a cup of the icing sugar. Stir in ½ Tbsp. of the cream and the vanilla. Add remaining icing sugar and beat until smooth, adding additional milk if required. 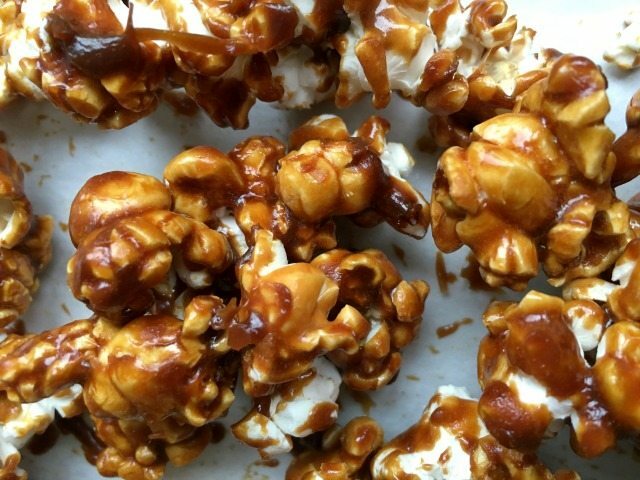 Maple Molasses Caramel Corn is almost too easy to make. Did you grow up eating Cracker Jack? We have a dear family friend who always tucked a box of Cracker Jack into little gift bags for me. It was a special treat because we never had it at home and it wasn’t something that I bought myself. Even the way it was (and still is) packaged made caramel corn special, since nothing else on the shelf is packaged in a similar way. And of course each box had a little surprise hidden inside. It’s the crispy texture of caramel corn that I love. 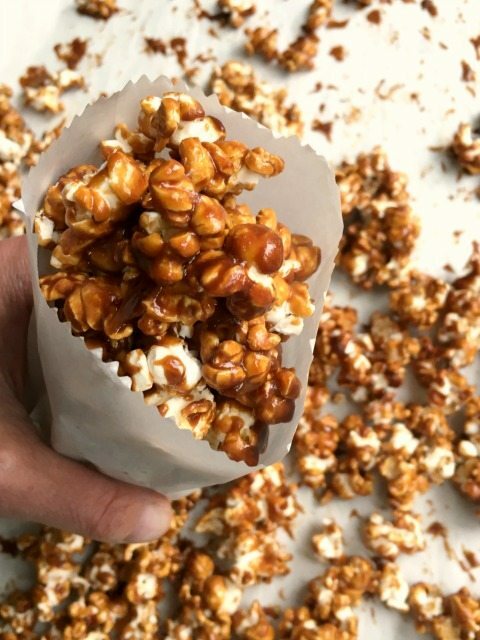 That thin, crackly coating of caramel on perfectly crisp popcorn is irresistible. I’m not fond of corn syrup so this version of caramel corn caught my eye. 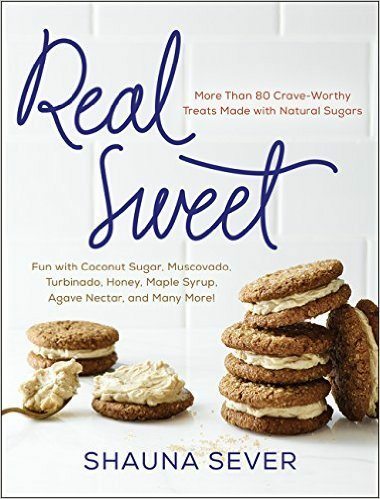 I adapted the recipe ever so slightly from the cookbook, Real Sweet, by Shauna Sever. This is a nut-free version of caramel corn – just the way I like it. Maple Molasses Caramel Corn is best eaten on the same day that it’s made. Place popped popcorn in a very large pot or mixing bowl. In a heavy pot stir together the maple syrup, molasses, sugar, water and salt. Bring to a boil over high heat and cook, stirring from time to time, until the temperature reaches 250 F. Remove from heat and stir in the vanilla (it will sputter), baking soda and butter. Pour over the bowl of popped popcorn and mix gently with a rubber spatula (you don’t want to crush the popcorn). When popcorn is well coated, scrape onto a large parchment-lined sided baking sheet. Spread in an even layer and bake at 250 F for 45 minutes, stirring every 15 minutes or so. 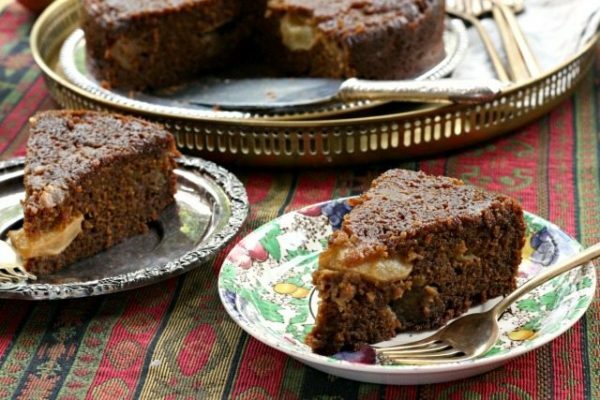 Sticky Upside Down Apple Gingerbread is a rich and very moist cake with beautifully balanced spicing. Serve on its own – no frosting or ice cream necessary. My mom has been baking this Upside Down Apple Gingerbread for years. It’s a recipe she clipped out of a magazine sometime in the late 1960’s. 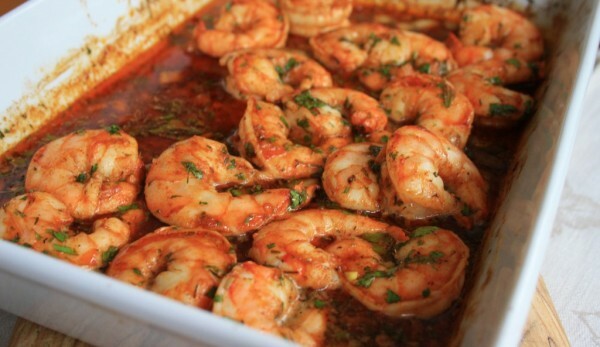 The recipe was so popular that it made its way into her giant handwritten cookbook. Sometimes old recipes are the best. 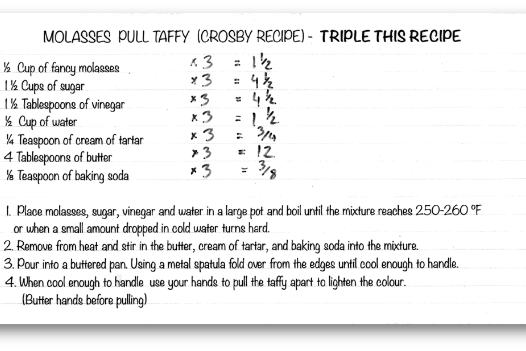 I rediscovered the recipe the other day when I was flipping through an old stack of handwritten recipe cards from my university days. 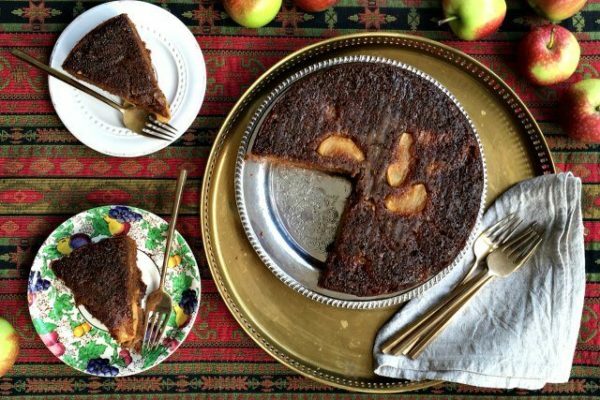 The cake caught my eye because I have been buying bushels of apples at our local farmers market and all things apple were top of mind. It is especially good served warm. I lined my pan with parchment paper because I was paranoid about the cake sticking. It worked but the apples didn’t caramelize like they would have against the bottom of a metal pan so next time I’ll skip the parchment paper like I did with this recipe for Rhubarb Upside Down Cake. Put the 1 Tbsp. and 1 tsp. of butter in a high-sided 9” pan and place it in the oven for a few minutes, until the butter melts. Remove it from the oven and use a pastry brush to coat the sides of the pan with the butter. Sprinkle the 2/3 cup of brown sugar over the melted butter in the bottom of the pan. Place the sliced apples on the sugar in a circular pattern. In a medium bowl whisk the flour with the baking soda, baking powder and spices. 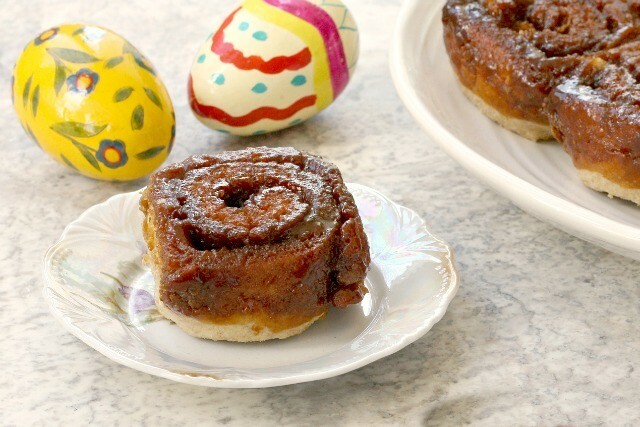 In a large bowl whisk the eggs with the ½ cup brown sugar. Whisk in the molasses and ¾ cup melted butter. Stir in the flour mixture. Add boiling water last and beat well. 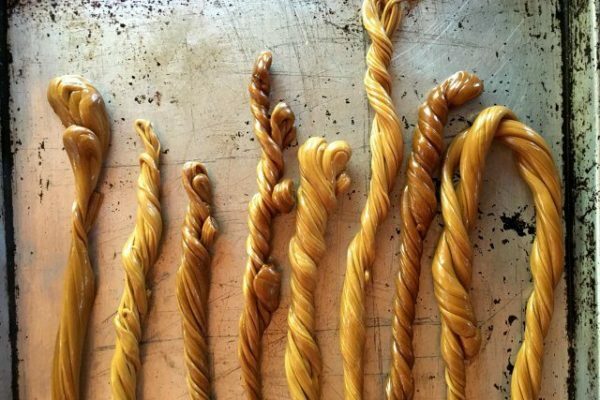 Who doesn’t love an old fashioned taffy pull? 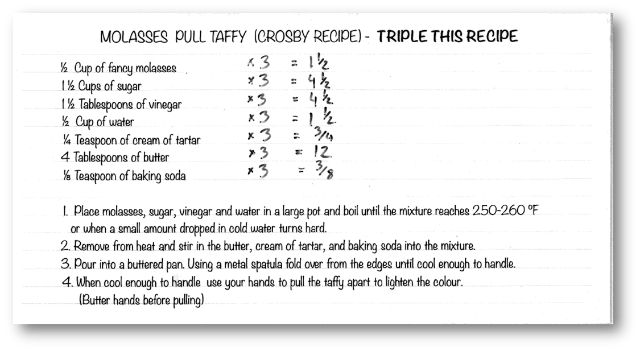 When I was little, making this molasses pull taffy recipe was great fun. 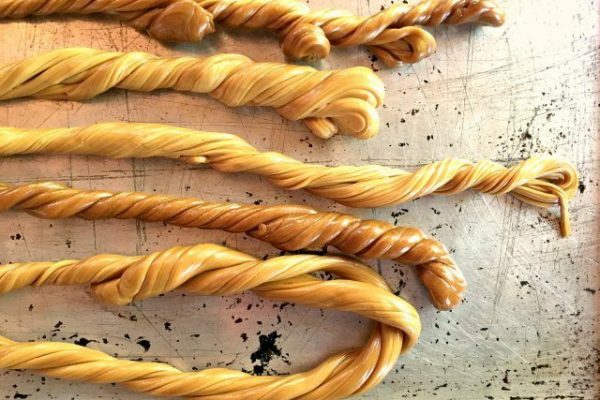 Slathering our hands with butter and pulling great gobs of soft taffy into glossy brittle strands was just about the ultimate in kitchen fun. 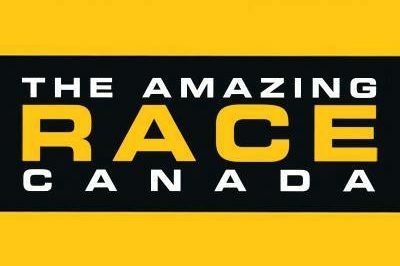 An old fashioned taffy pull became a competitive sport last spring when The Amazing Race Canada teams visited our plant in Saint John during filming for the show’s fourth season. Cooking under pressure is stressful. All four teams arrived at our plant for the sticky challenge – a four-way cook-off — in a race to be the first to complete the task. In the end all four teams met the challenge and raced off to St. Andrews for the next leg of the competition. In a heavy bottomed pot, combine molasses, sugar, vinegar and water. Bring to a boil and cook, stirring often, until mixture reaches 255 F (or when a small amount dropped in cold water turns hard). Remove from heat and add butter, cream of tartar and baking soda. Pour onto a buttered, sided cookie sheet. When cool enough to handle, pull pieces of taffy until light in color. (Butter hands before pulling). Twist and cut into 1” pieces. Wrap in parchment paper. A wholesome scone with no refined sugar. 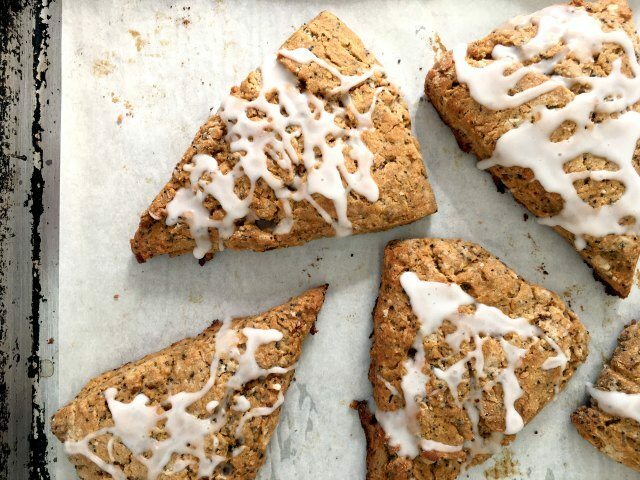 If you thought muffins were easy to make wait until you try these lemon poppy seed scones. They’re quick to whip up and take hardly any time to bake. 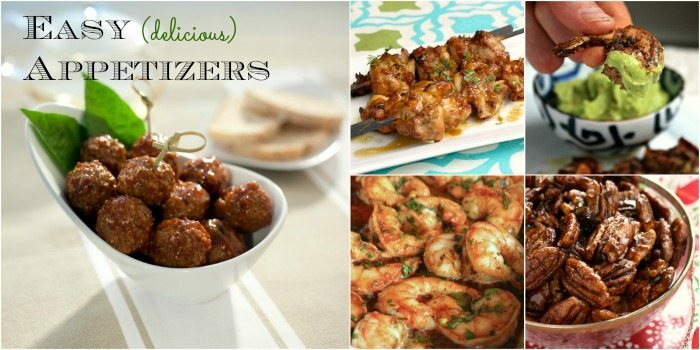 Enjoy them for breakfast with fresh jam or as an afternoon snack. Scones are an easy way to make a slow summer morning feel a bit like a holiday. You’ll have these scones in the oven in about 10 minutes and they’ll be cooling on the counter in under 20 minutes. Be sure to eat them while they’re still warm. Scones are always best on the day they’re made so eat up. 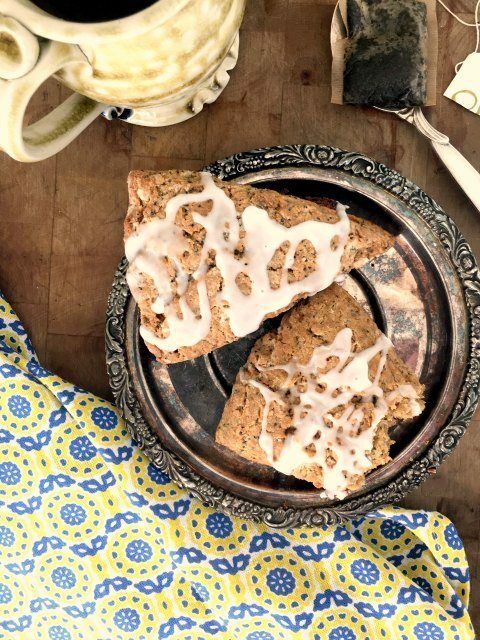 Lemon poppy seed scones are sweetened with molasses and maple syrup. No refined sugar. Use whole wheat pastry flour to make them extra wholesome. Lemon poppy seed scones were our morning snack last weekend before we headed off to the Fundy Trail, a spectacular driving and hiking route along the Bay of Fundy in Southern New Brunswick. Preheat oven to 425 ̊F. Line a baking sheet with parchment paper. In a large bowl whisk flour, baking powder, salt, poppy seeds, and lemon zest. Cut in the butter until it’s pea-sized. In a small bowl, whisk egg, heavy cream, lemon juice, molasses and maple syrup. Pour over the dry ingredients and stir until just combined. Scrape dough onto a floured surface, knead lightly until it just comes together then lightly pat into an 8” circle that’s an inch or so thick. Cut into 8 wedges. Set wedges to the prepared baking sheet about 2” apart. Brush with heavy cream. Bake the scones until firm to the touch and golden, 18-20 minutes. Remove from the oven and transfer to a rack to cool. Whisk icing sugar, milk and lemon zest in a bowl. 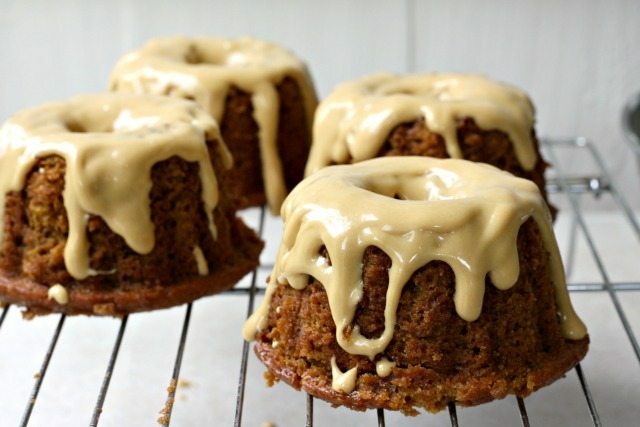 While scones are still warm drizzle or spoon over the icing. 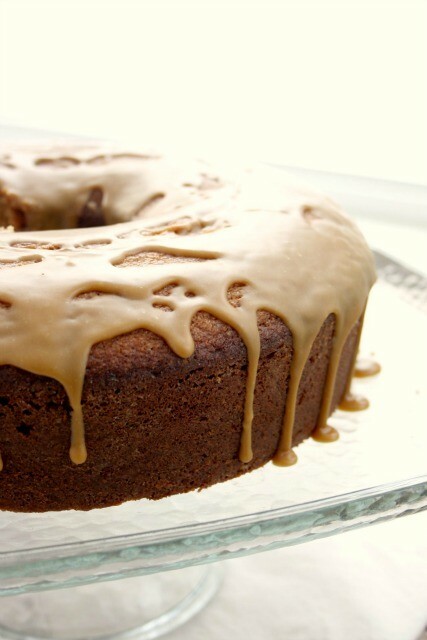 If a muffin became a cake, this Whole Orange Molasses Cake would be it. Olive oil cakes are a traditional sweet from the Mediterranean region. They’re moist and often flavoured with orange. 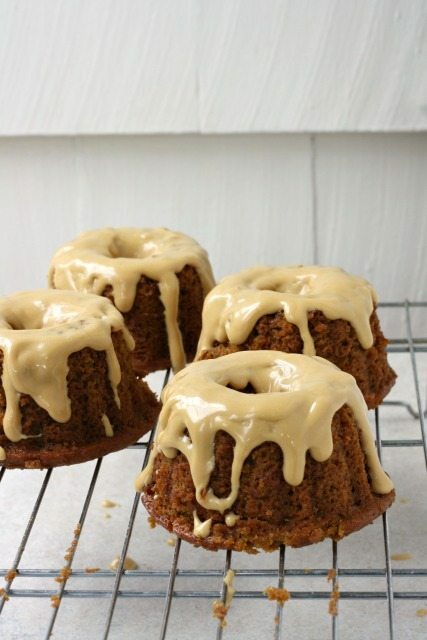 They’re also usually sweetened with honey, but molasses and orange are such a perfect pairing that swapping out the honey was an easy option. There is a freshness to orange cake that reminds me of spring. It’s all in the flavour, I suppose, but this cake also lends itself to light frostings and additional fruit, kind of like strawberry shortcake. In fact, this cake would be terrific with sliced strawberries and whipped cream. And the cake itself isn’t too sweet, which is why it reminds me a bit of a muffin. 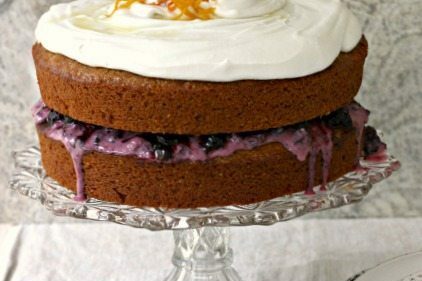 This recipe makes two 8-inch cakes, perfect for layering with your favourite jam and whipped cream. 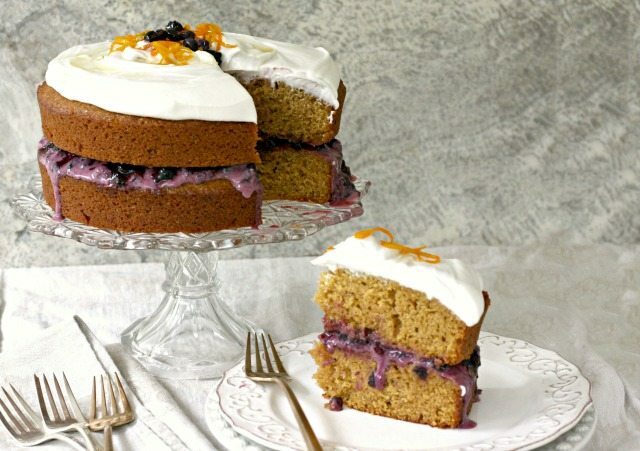 This recipe makes two 8-inch cakes, perfect for layering with your favourite jam and whipped cream. 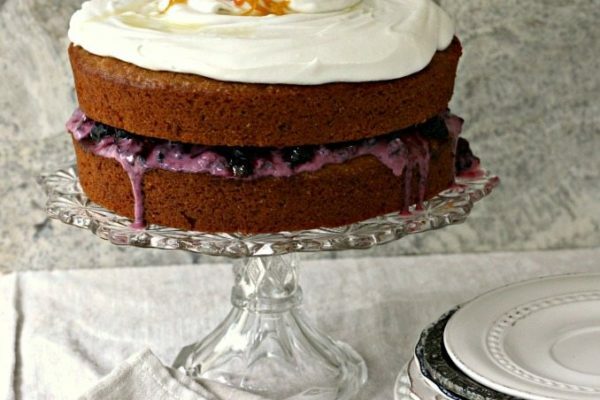 I enjoy Whole Orange Molasses Cake served Washington Pie-style, filled with my Uncle Walter’s black currant blueberry preserves and whipped coconut cream. 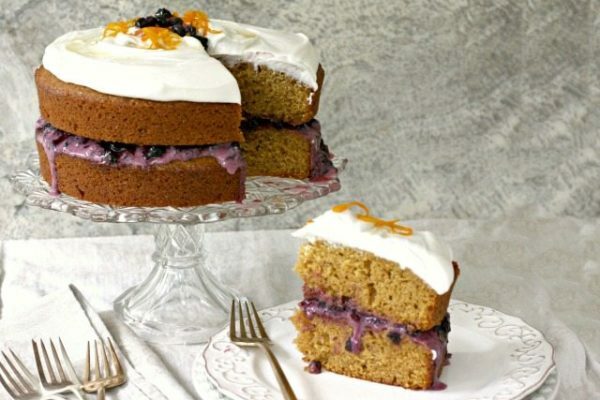 If you want to make the cake even more orange-y, add the zest of one of the oranges to the batter. Preheat the oven to 325. Grease two 8” round cake pans (lining the bottoms with parchment is helpful). Place the oranges and molasses in a food processor and pulse to a pulpy juice. In a large bowl whisk the sugar, eggs, and olive oil until combined. In another bowl whisk the flour, baking powder, baking soda and salt. To combine all three mixtures: Stir in the flour mixture into the egg mixture, alternating with the orange juice mixture, beginning and ending with the flour. Stir just until combined. Scrape batter into prepared cake pans. Bake for 35-40 minutes or until the tops spring back and a tester comes out with just a few crumbs attached. 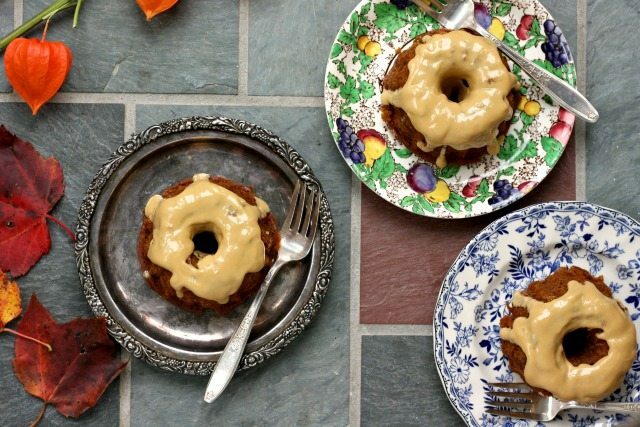 An old fashioned gingerbread for spring. 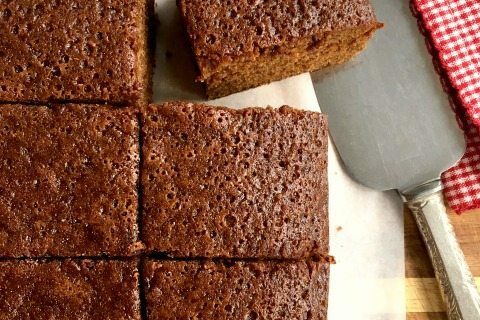 This easy hot water gingerbread is about the simplest cake recipe out there. It’s practically as fool proof as a cake mix. You toss into a bowl everything but the flour and water, then mix. Next, add the water, then mix. And finally, add the flour. 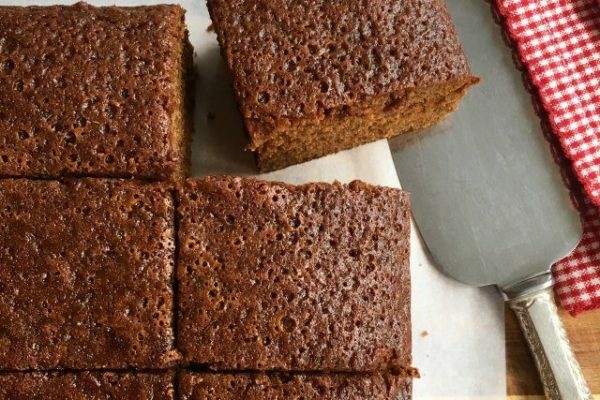 Its a method that’s exactly what your junior high home-ec teacher taught you not to do but it works and the result is a beautifully-textured gingerbread. This kind of old fashioned gingerbread is comfort food for me. 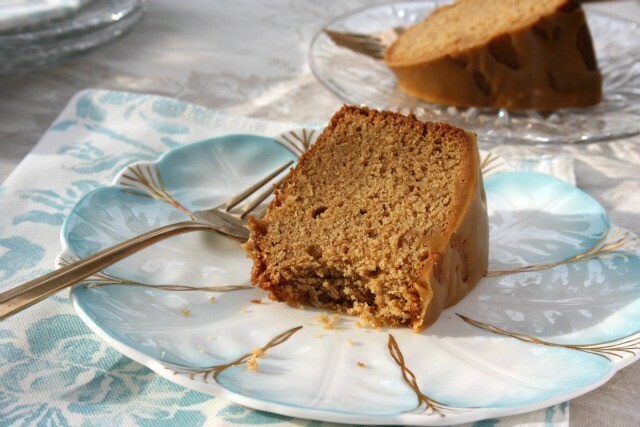 Something about the flavour of ginger, the moist texture of the cake and the smell of the cake baking makes me feel just a little bit warmer on a damp spring day. 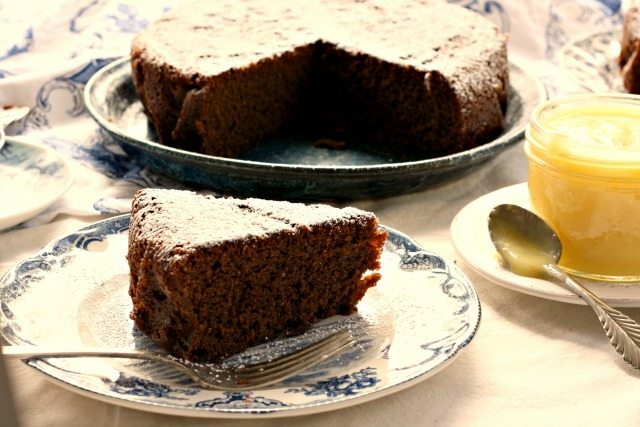 This easy hot water gingerbread can be a true snacking cake – a bit like a muffin, only sweeter. If you want to dress it up, just sprinkle with a dusting of icing sugar. 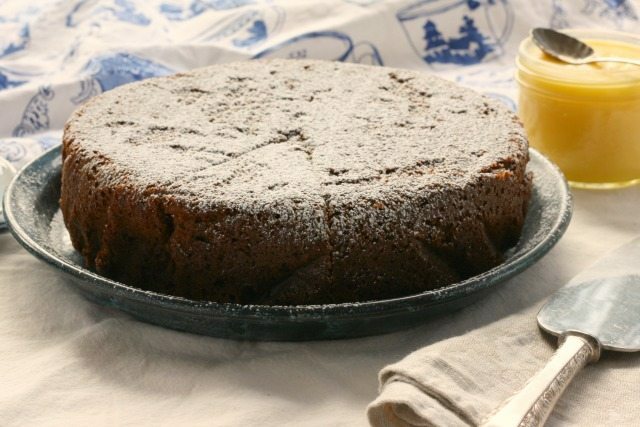 Lemon sauce or lemon curd is an old fashioned accompaniment to gingerbread, something that my grandmother always served with this spiced cake. It helps gingerbread transition from winter to spring. 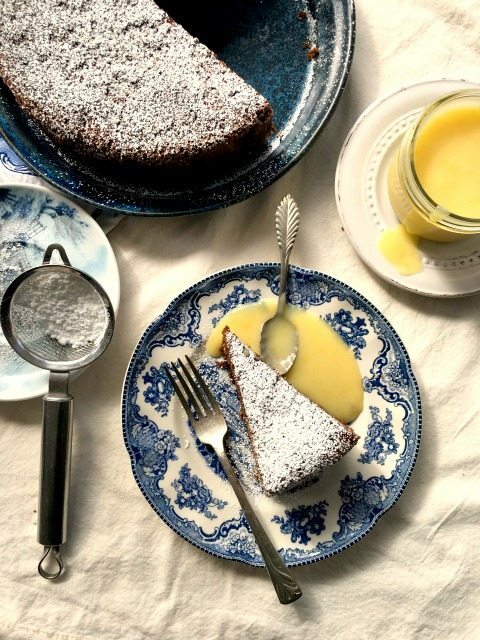 Below the gingerbread recipe you’ll find a link to my go-to recipe for lemon curd. It’s very easy (my daughter has been making it since she was 9) and is very tart. Grease and flour a 9” high-sided cake pan (round or square) or line it with parchment paper. In a large bowl, combine egg, sugar, butter, molasses, salt, baking soda and ginger. When thoroughly blended, add hot water; stir, then add flour. Pour into prepared pan. Bake at 350°F for 45 minutes, or until a toothpick inserted in the centre comes out clean. When cool, sprinkle with icing sugar if you like. Serve with whipped cream and/or lemon curd. Sometimes all it takes to be Super Mom is some chocolate and marshmallows. 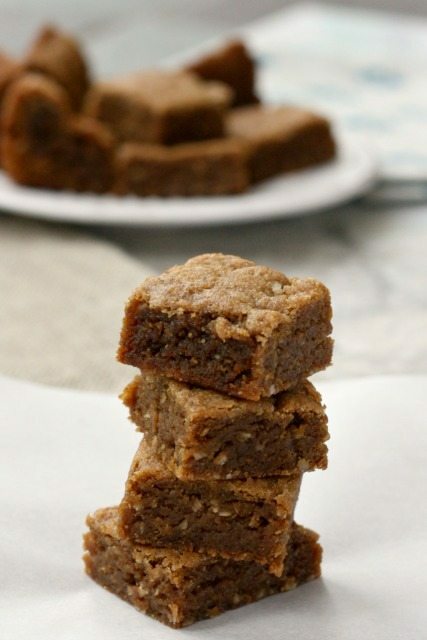 Perfectly delicious Molasses Oat Blondies make a yummy base for oven-baked s’mores and they’re so simple — just plop a little chocolate and some marshmallows on top at the end of baking and put them back in the oven. Then cut into marshmallow-sized pieces for a messy but appealing treat. 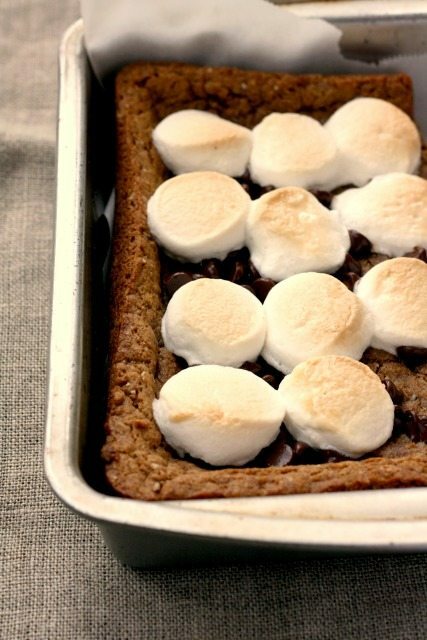 The s’mores version of these blondies was like catnip for my kids. 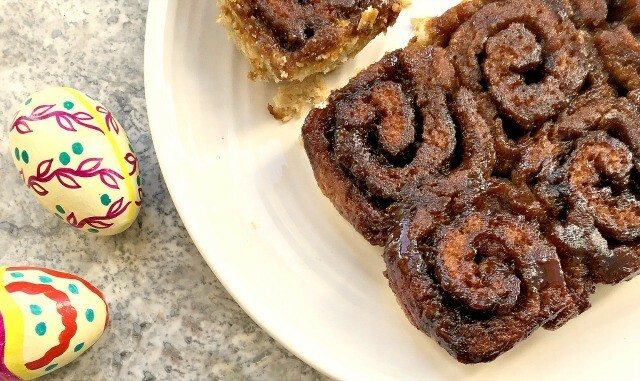 More often than not they take homemade baked goods for granted but this recipe stood out. They lined up for their molasses oat s’mores. These squares are surprisingly rich on their own but have a wholesome sort of taste thanks to the rolled oats. Feel free to use some wholegrain flour in the mix (whole wheat or spelt) to add more fibre, flavour and nutrition. And the 2 tablespoons of vanilla in the recipe is not a typo. 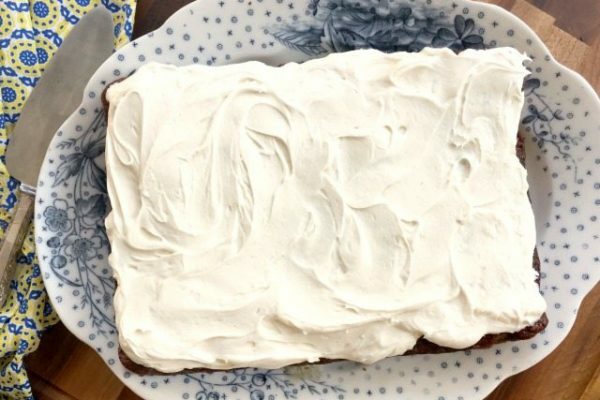 The vanilla gives them somewhat of a grown up flavour but can be scaled back to one tablespoon if you think it will be too overwhelming for you. 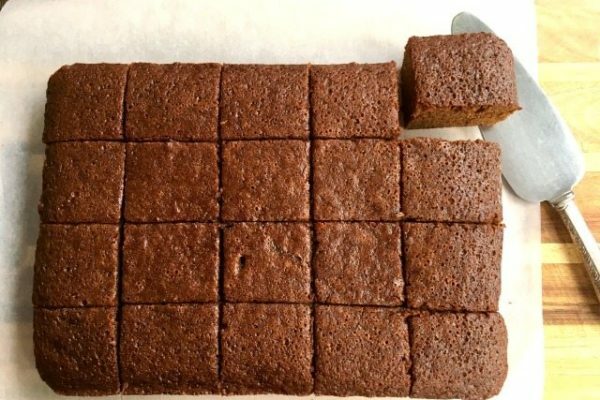 Like all good brownies (and blondies), these are a little chewy and are great with anything on top. 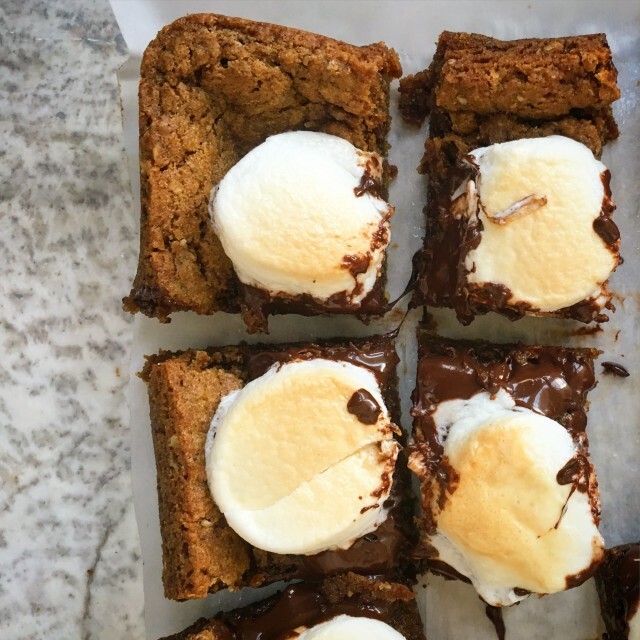 If s’mores aren’t your thing cut them into larger pieces and serve with a scoop of ice cream. Butter a 9”x9” baking pan or line it with parchment paper. 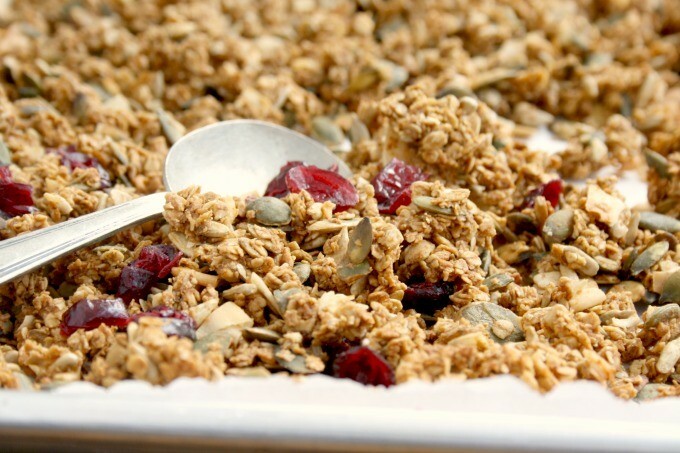 In a large bowl combine the flour, rolled oats, brown sugar, baking soda, salt and cinnamon. Cut in the cold butter until only pea-size or smaller pieces remain. 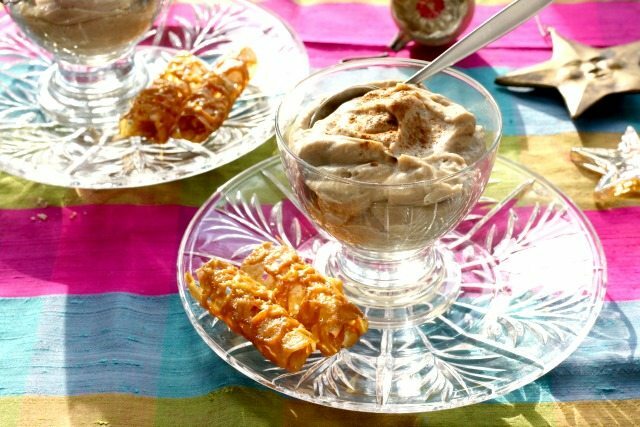 In a small bowl whisk the molasses, milk and vanilla. Add wet to dry and stir until well combined. Scrape batter into prepared pan, spread evenly and bake for 25-30 minutes. 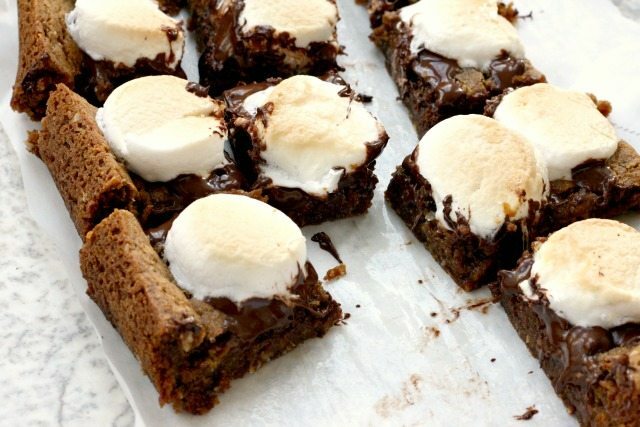 Once they’re cooked, top with ½ cup chocolate chips and 10 marshmallows that have been cut in half. Place back in a 350 F oven for 5-10 minutes, until the marshmallows are golden on top. 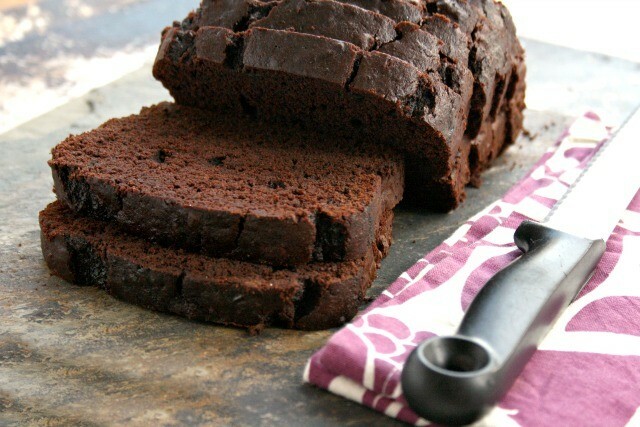 Dark chocolate banana bread is mildly sweet with a very fine crumb and subtle banana flavour. It’s extra chocolaty with a whole cup of cocoa powder and half a cup of dark chocolate chips. So many bananas, so little time. Whether they’re over ripe on the counter or over ripe and a great deal at the grocery store, I’m sure we have all found ourselves with bananas that are just perfect for cooking. So we whip up a batch of banana muffins or bake a loaf of banana bread. 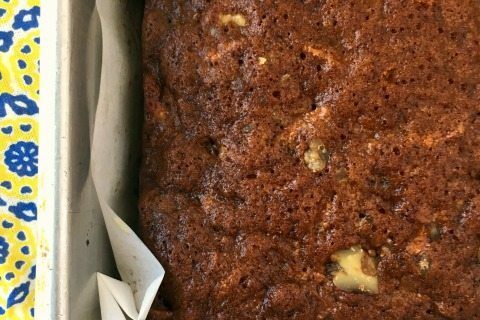 This is not your mother’s banana bread. You can make one giant loaf or split it between two medium-sized loaf pans. It takes a good long time to bake so choose your pans according to how long you’re willing to wait to eat it. In a medium bowl, whisk the flour, sifted cocoa, baking powder, baking soda & salt. In a large bowl cream the butter with sugar until fluffy. Beat in the molasses then the eggs, one at a time. Beat in the mashed bananas. 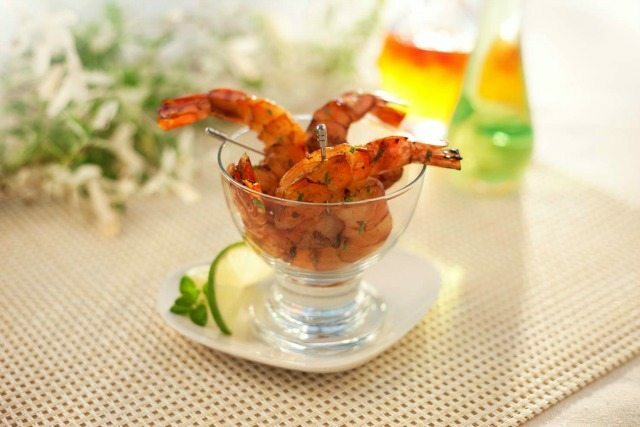 Using a wooden spoon or rubber spatula, add the dry ingredients in 3 additions, mixing gently until almost incorporated. Stir in the milk then fold in chocolate chips. Scrape the batter into prepared pan. Set an insulated cookie sheet in the oven and place the banana bread pan on the cookie sheet. Bake for 30 minutes then cover the bread loosely with a piece of foil. Bake for another 45-60 minutes (total baking time is between 75 minutes to 1 ½ hours), or until a wooden skewer into the center comes out almost clean. Transfer the pan to a rack and cool for at least 20 minutes before pulling it out of the pan, parchment paper and all. Store in an airtight tin up to three days. *If you divide the batter between two pans adjust the baking time accordingly. (You might want to start checking the breads at about 40 minutes). I was at a Yankee Swap the other night and the gift that I would have loved to take home was full of homemade goodies: a cute cable knit hat, homemade apple butter and homemade granola. It was the gift my friend Tiffany put together, gathered from her stash of homemade items that she has been making over the past few weeks. “We’re doing all homemade gifts this year,” she told us. 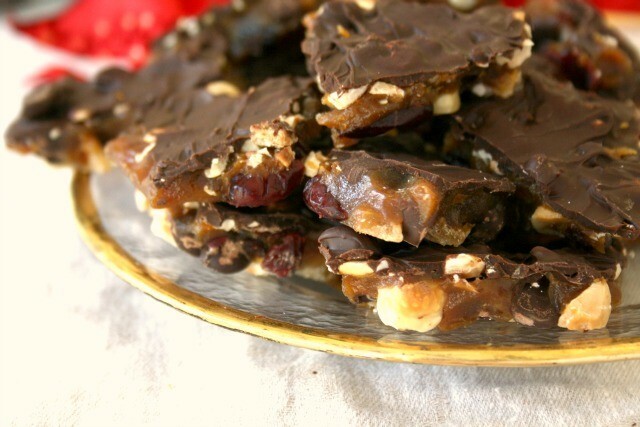 It got me thinking about easy edible gifts that anyone can make if you can grab a spare half hour. 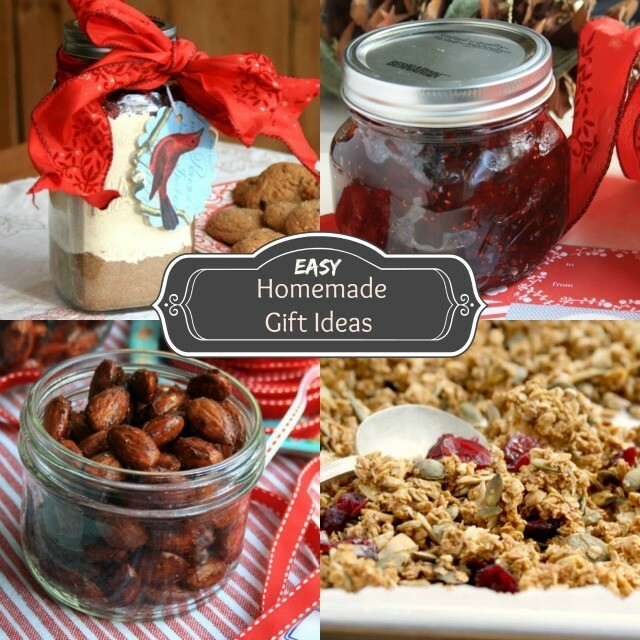 I love the idea of homemade gifts and not just because I prefer to avoid the mall. Homemade gifts are extra special, always thoughtful and tend to be on the practical side so get put to good use. If you get into an annual habit you’ll find that people will look forward to receiving your special gift and it just might become part of their holiday traditions too. 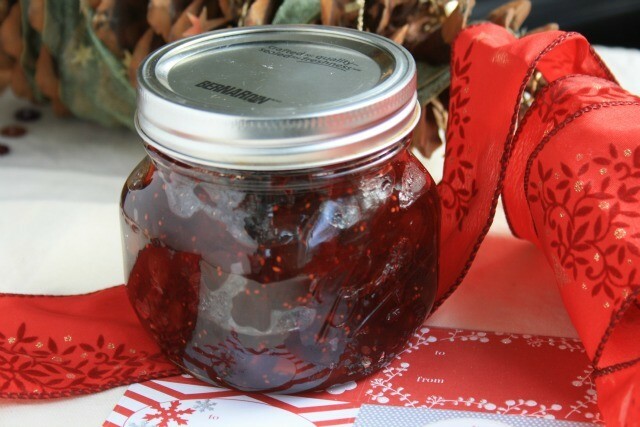 Making homemade gifts is also a way to cut down on your annual gift spending. I know ingredients aren’t cheap but most of these recipes make enough for at least a couple of gifts. Apple Cranberry Sauce: Lightly spiced and a gorgeous garnet colour, this quick and easy holiday staple can last up to two months in the fridge. 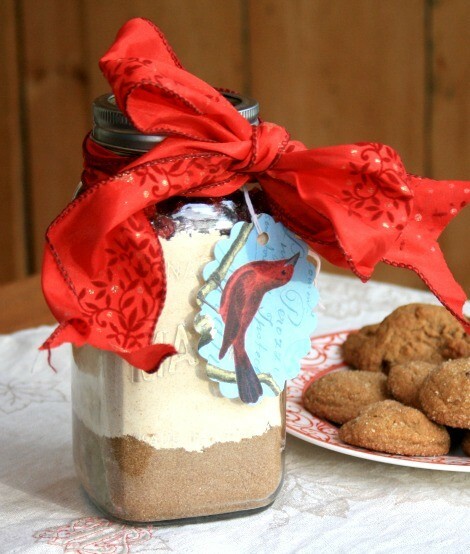 “Cookies in a Jar”: A homemade cookie mix that includes the dry ingredients for our popular Orange Spice Crackle Cookies. 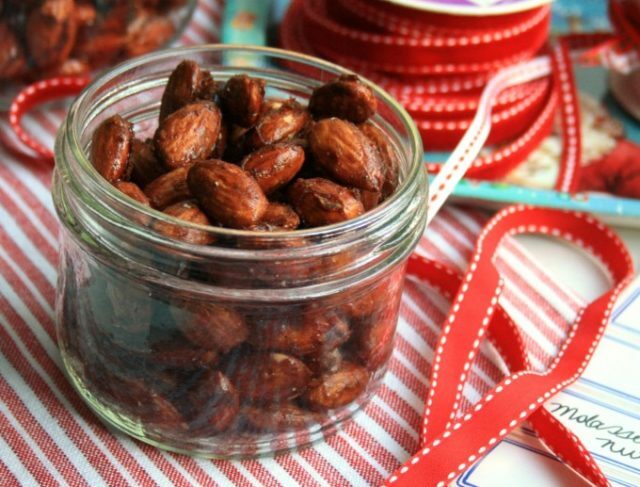 Gingerbread Almonds: A deliciously sweet and spicy treat that is surprisingly easy to make. Once in a while I have the urge to create something that looks extra special. 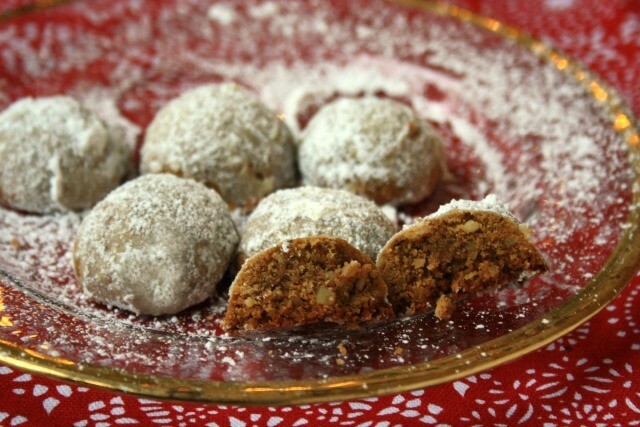 That’s why this recipe for Molasses Walnut Meringues caught my eye. While I’m no expert with a pastry bag, meringue I can make, and meringue has a way of looking fancy with next to no effort. You might be surprised at how easy it is to make meringue — a few ingredients, a good set of beaters and you’re set. Be prepared to feel very accomplished with very little effort. 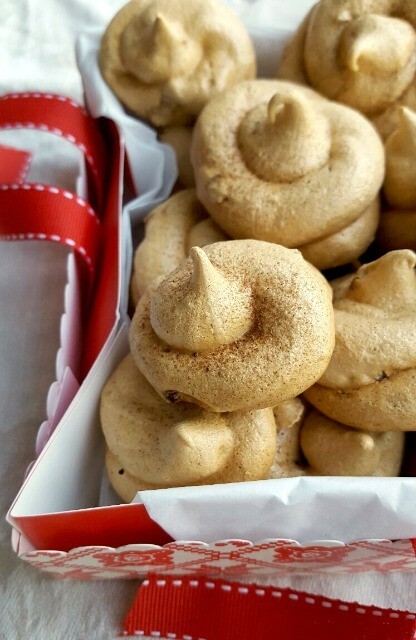 These meringues have a glossy golden look to them and are very pretty on a plate filled with Christmas cookies. 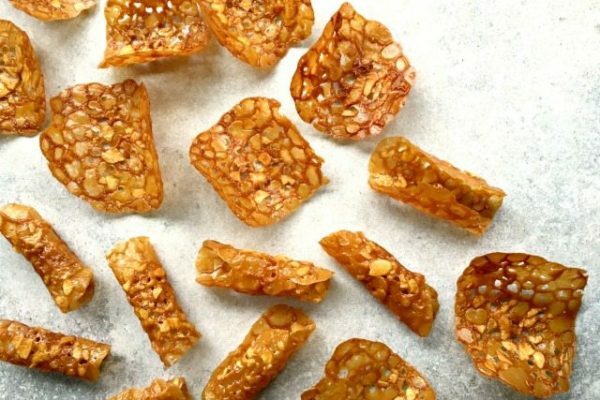 The taste reminds me of the sponge toffee from my childhood and the texture is similar too. The cooking time presented with the recipe is very broad because sugary things can have a mind of their own. 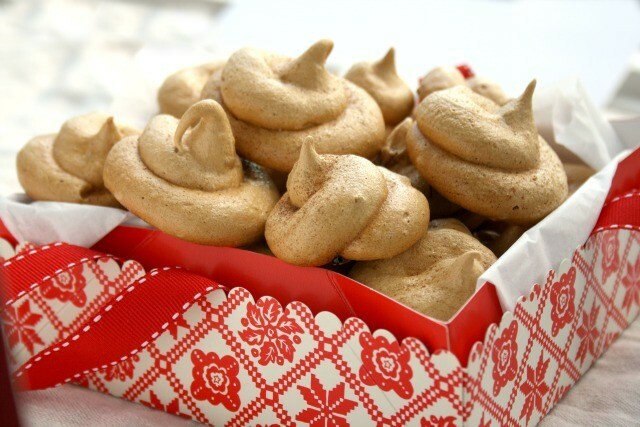 Molasses Walnut Meringues bake in a slow oven for a long time, until they dry out, which can vary depending on their size. Preheat oven to 225 F. Line baking sheets with parchment paper. Beat egg whites on medium until foamy (about 30 seconds). Whisk together granulated sugar, salt, cornstarch and icing sugar and gradually add to egg whites. Using a rubber spatula fold in the molasses and walnuts. Spoon mixture into a piping bag or a plastic bag with a bottom corner snipped off. Pipe onto prepared baking sheets (in either swirls or big dollops) about an inch apart. Dust lightly with a few pinches of gingerbread spices. Bake meringues until they have completely dried out, anywhere from 1 1/2 to 2 hours depending on the size and shape you choose. Blend spices and store in a cool, dry place.